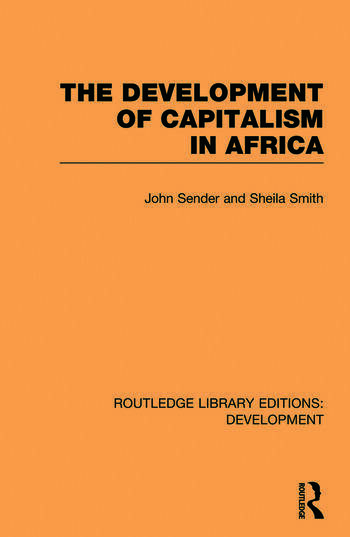 First published in 1986, this work challenges underdevelopment analyses of Africa’s past experiences and future prospects, and builds upon a very wide range of recent historical research to argue that the impact of Capitalism has resulted in economic progress and significant improvements in living standards. In marked contrast to the dependency approach, they propose that the important political and economic differences between the experiences of developing countries should be stressed and analysed. The argument is supported by a detailed look at the emergence since 1900 of capitalist social relations of production in nine different countries. 1. Introduction 2. Trade and Primary-Commodity Production Before Independence 3. The Emergence of Wage Labour 4. Trade, Industrialisation and the State of the Post-Colonial Period 5. Conclusion: Wishful Thinking or Effective Reality?